I didn’t really wake up today with the intention of painting. It just sort of happened that way. I know looking at this should make me feel like it was a questionable choice, but I think it was fine. I was careful and didn’t take out anything that was actually connected to anything. And the walls, door frames, and baseboards all thank me greatly. Of course, this entailed plugging tons of holes in the walls, and peeling lots of paint that was practically peeling itself off the walls. I swear, it wasn’t provoked. Well, barely. I have a problem. I feel like I’m taking on a mini-renovation, but I’m okay with it. I think this stuff is really satisfying. This picture’s of my bedroom, but I’m taking painting one room at a time, starting in the living room. So at the end of the day, I’d gotten the ceiling done. I know you thought these walls were white, but check out that contrast! The ceiling alone ended up taking three coats and an entire gallon of paint. Perhaps I should have primed. The ceiling is Benjamin Moore’s Simply White in eggshell. 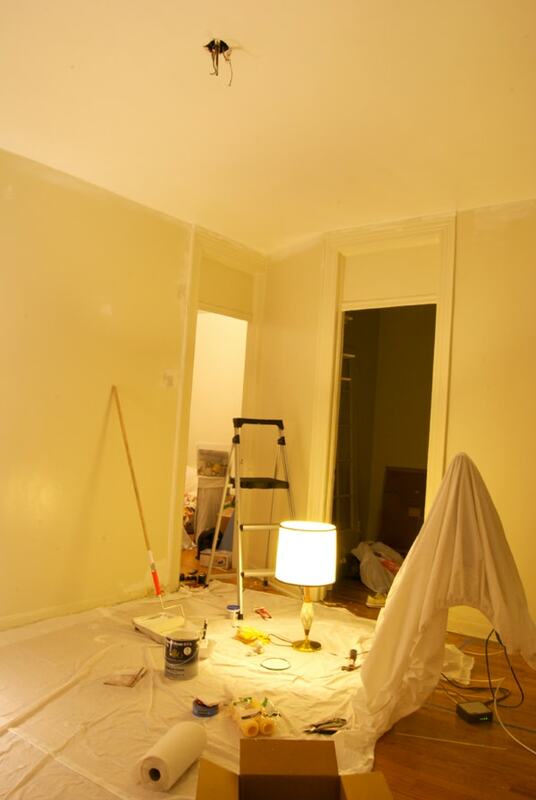 Sorry for the night pictures, the walls really do look (dirty, old) white in real life! I swear they’re not painted yellow. Lots of work ahead, can’t wait for the painting to be done! Let me count the ways that I love you. I hope your landlord doesn’t visit often and doesn’t find your blog. I know this is coming really late, but I just discovered your blog today (love it!) and found this post. 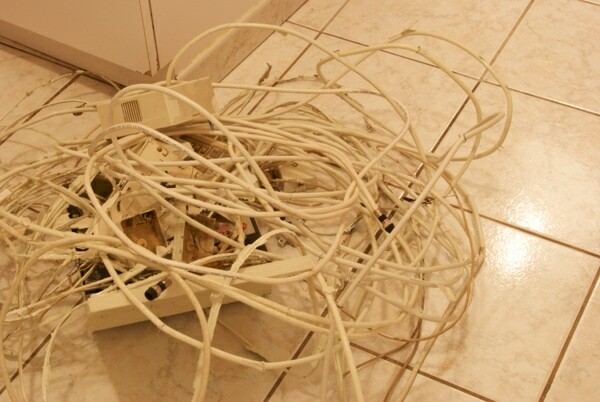 When I moved into my apartment 1 year ago, I had (and still have) the same issue—millions of small cords painted and stapled to the wall. I took many of them down, but have left a few because I really need some guidance on how to repair the walls once I’ve taken them down. Can you give some helpful hints/tips that made the process not so daunting? Is there a particular kind of sandpaper or sanding item that you recommend? 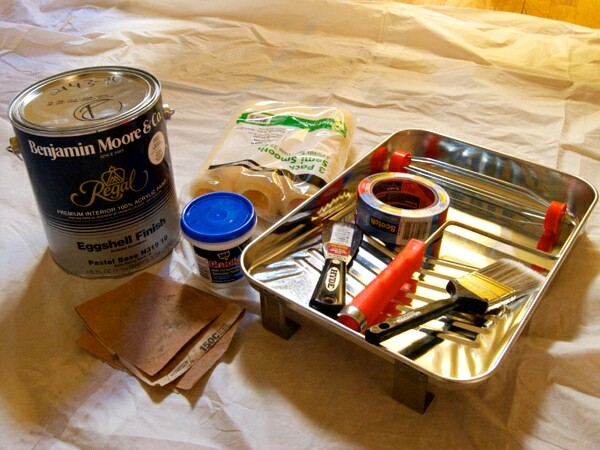 Did you use wood filler,spackle, plaster or something else? Anything you can suggest—I’d be very appreciative! 1. Use a spackle knife (or razor blade if necessary) to chip away at remaining paint around where cord used to be. 2. Spread spackle over holes. Sometimes it’s easier to use your finger when you’re working in corners. 3. Sand spackle, I usually use a medium grit. If you’re sanding on flat walls or moldings, sometimes it’s easier to use a sanding block (I like the kind with the handle that the sandpaper clips into, you can buy them at any hardware store), but not necessary. 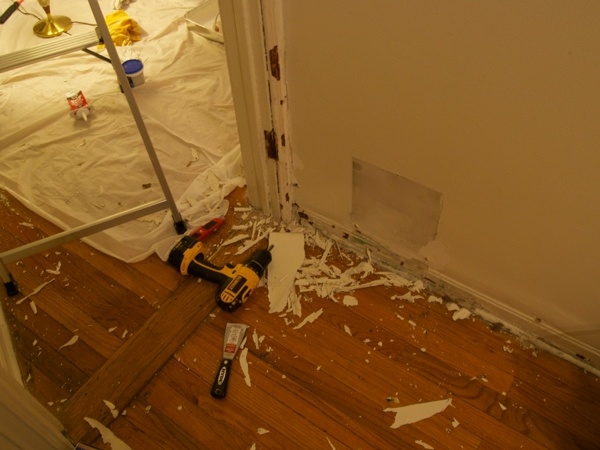 Sometimes, depending on the size of your hole, you’ll need to do a couple layers of spackle to get everything smooth and even!